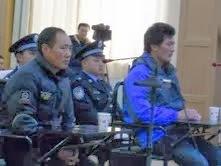 Lobsang’s uncle, Lobsang Kunchock, received a suspended death penalty (Editor’s note: suspended death penalities are usually commuted to life in prison, unless the prisoner is alleged to have committed a crime in the first two years of his sentence). The older Lobsang was a monk from the Kirti monastery in Ngaba prefecture (Chinese: Aba) in China’s southwestern Sichuan province. However, state run news agency Xinhua reported that the two had passed information to Tibetans in India about the people who had self-immolated, hinting at charges against the two for sharing information with individuals outside Tibet. The two were detained during a drive by Chinese authorities to criminalize self-immolations in Tibet. Little personal information is known about Lobsang, who is of Tibetan descent. At the time of sentencing, Lobsang was 31 years old.